Impression.ca-Magnetic Back Sticky Note Pads 4" X 6"
Magnetic Back Sticky Note Pads 4" X 6"
Magnetic Back note pads are custom printed with your logo or message. This size will handle large logos while maintaining an ample writing area. This 4 inch x 6 inch note pad has an approximate count of 260 sheets to an inch. 25 Sheets 1 Colour Imprint $1.66 $1.29 $1.22 $1.04 each. 25 Sheets 2 Colour Imprints $2.30 $1.62 $1.38 $1.16 each. 50 Sheets / 1 Colour Imprint $2.45 $1.99 $1.92 $1.74 each. 50 Sheets / 2 Colour Imprint $3.25 $2.37 $2.08 $1.85 each. 100 Sheets 1 Colour Imprint $4.15 $3.53 $3.44 $3.04 each. 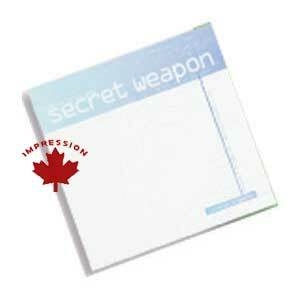 100 Sheets 2 Colour Imprints $4.96 $4.01 $3.65 $3.22 each. 4-colour printing is your choice of either 4 spot colours or 4 process colours. If a faster shipping is required, there will be a US $350.00 rush charge fee. To find the earliest shipping date available for the delivery you require, please fill in the Contact Us Form with the item number you are enquiring about and the delivery date you need. All pads that are to be printed with a bleed must have all their text and logos inside the safety imprint area or they will be cut off. The safety area is 1/8" smaller than the pad size. We do not recommend printing a solid colour over the glue line.